Compatible With All Standard Cleaning Solutions. Fastens In Place With Tape Or Wrap Of Choice. 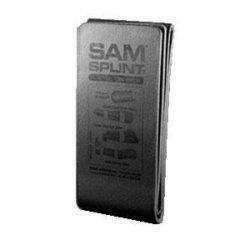 You have selected Bound Tree Medical LLC Sam&reg; Finger Splint Universal Gray Reusable, Waterproof from Braces. We hope that this Bound Tree Medical Llc Sam&reg; Finger Splint Universal Gray Reusable, Waterproof made by Parr Emergency Products is what you were looking for. If you have any questions about this particular Bound Tree Medical LLC Sam&reg; Finger Splint Universal Gray Reusable, Waterproof or any other products from Braces, please call us. We have an experienced staff that will gladly help pick out the correct Bound Tree Medical Llc Sam&reg; Finger Splint Universal Gray Reusable, Waterproof for you, also. If you are looking to make a purchase of Bound Tree Medical LLC Sam&reg; Finger Splint Universal Gray Reusable, Waterproof in large quantity or you are a Hospital or Medical facility and need help on making a purchase of Bound Tree Medical Llc Sam&reg; Finger Splint Universal Gray Reusable, Waterproof made by Parr Emergency Products, please contact us.